Happy Weekend to my Middle East friends! Since yesterday I have been on a cooking spree… The day started with dosas paired with Potato sabzi and Tomato and Coconut Chutney. Although I didn’t get the time to click snaps of the dosas, I did manage to get shots of the accompaniments. 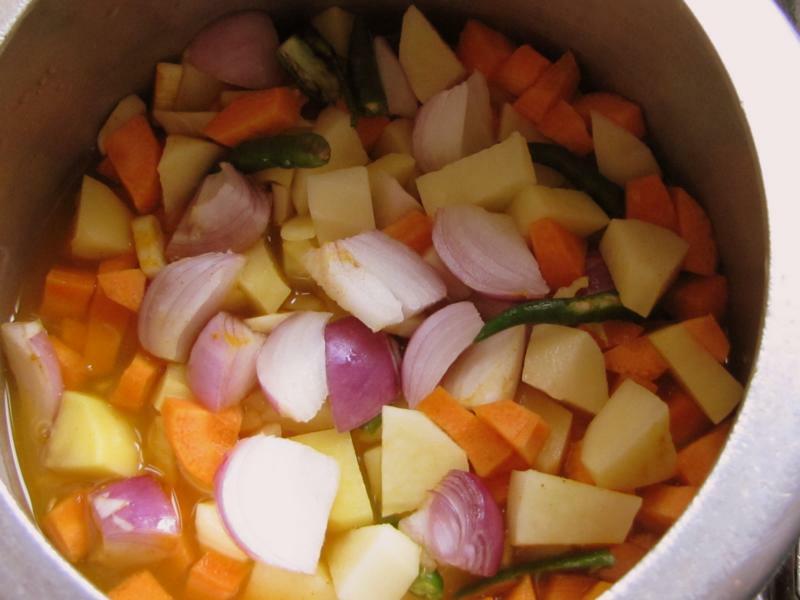 This Potato sabzi is one of the first recipes I learnt to cook and mastered while still at school. So it is as old as my cooking skills I can say… It is quick and easy. You can hardly go wrong with it. It is great as breakfast with dosas or as a meal with chapattis or puris. Using carrots in this recipe is a bit unorthodox, but I love the colours and the slightly different flavor it gives to this otherwise commonly made dish. Since it is pressure cooked, it barely takes a few minutes to get this dish ready and waiting to be gobbled up. 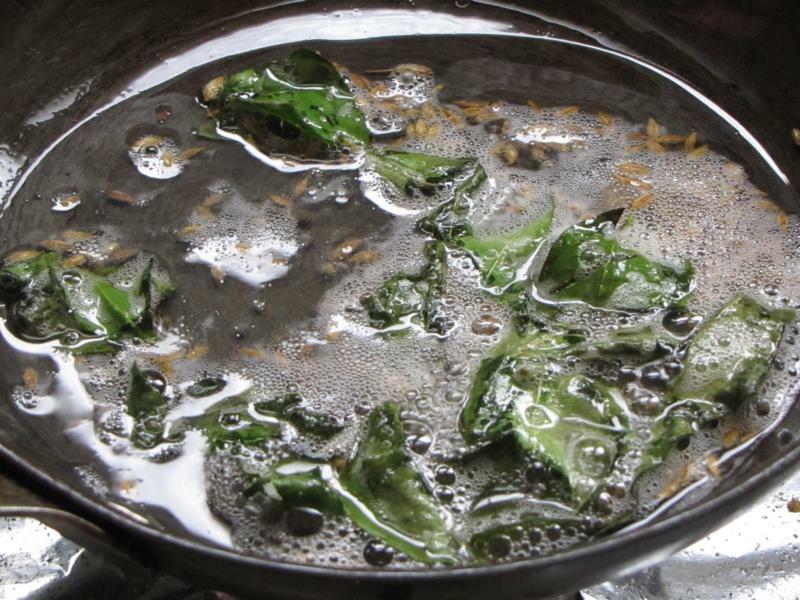 Cook with very little water as you don’t want the end result to be watery. 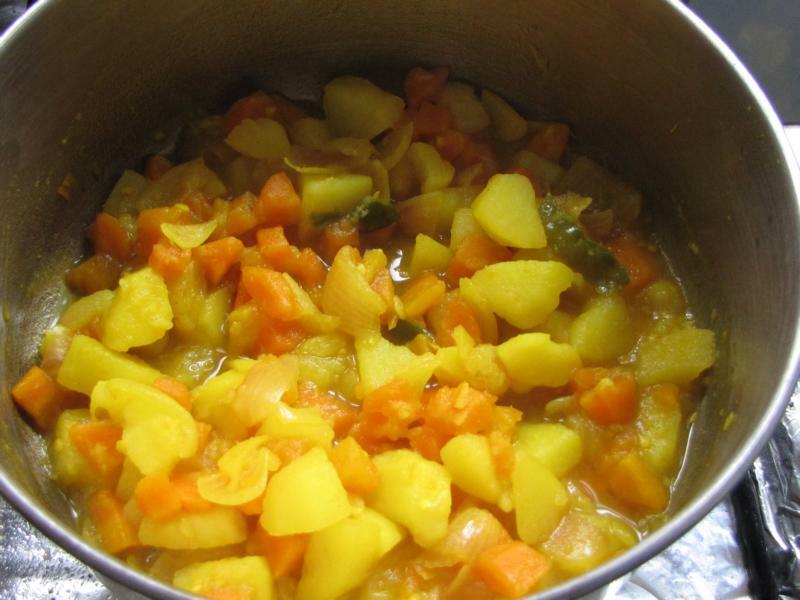 The pressure cooked vegetables are tempered with curry leaves, mustard and cumin seeds. I prefer to use coconut oil for the tempering, but it may not be for everyone. Vegetable oil can also be used. 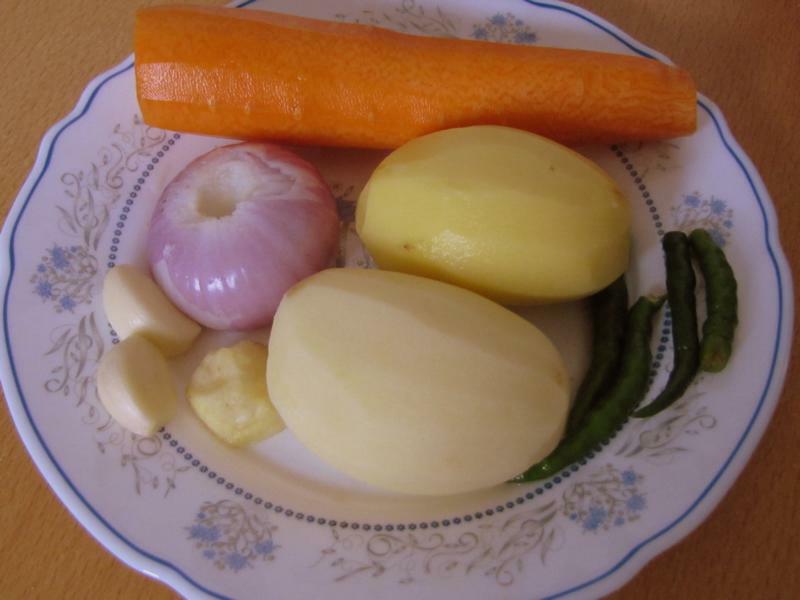 Pressure cook the potatoes, carrots, onion, garlic, ginger, green chili, turmeric powder and salt with little water till it whistles once. For the tempering, in a pan, Heat oil, add the mustard seeds. 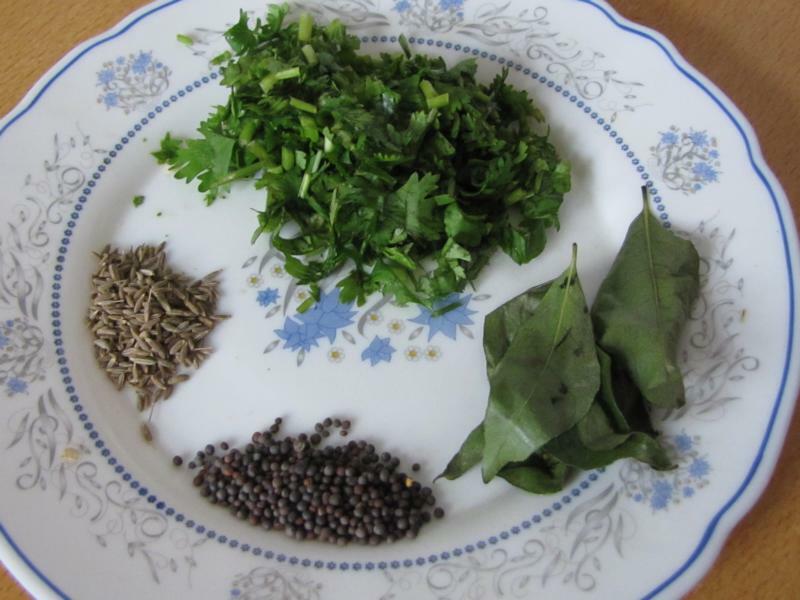 When it starts to splutter, add the cumin seeds and curry leaves. 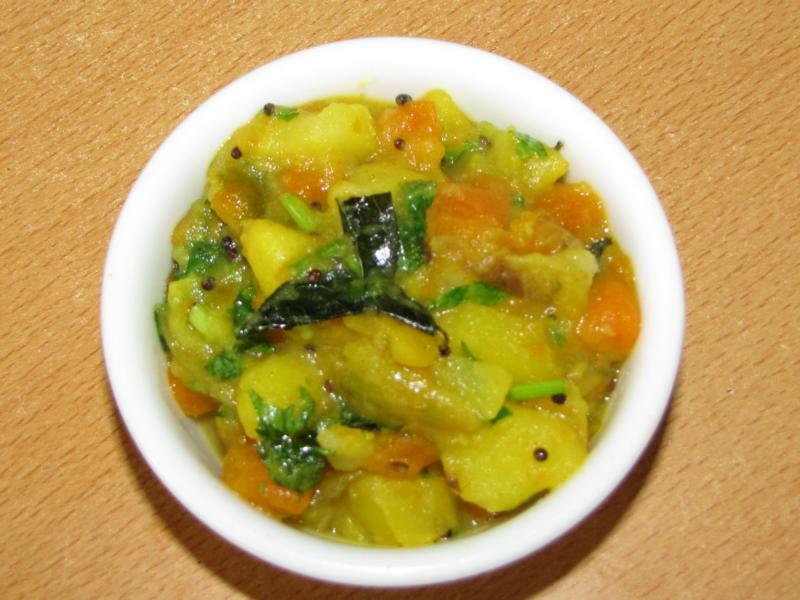 Pour this over the cooked potato mix and garnish with coriander leaves. Serve with dosas, chapattis or puris.